I have a new book which I just love! 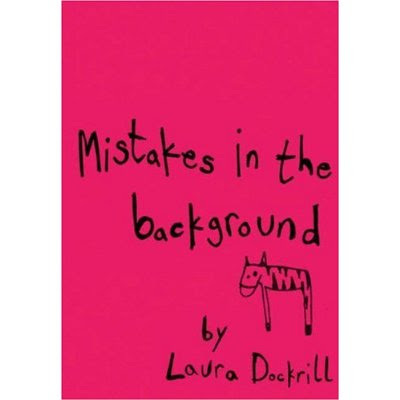 Mistakes in the background, the first published book by Laura Dockrill, a poet and illustrator, recently voted by The Times as one of the top ten literary talents of 2008. She has also created artwork for Kate Nash. `Mistakes in the background' seems to becoming one of those `Marmite books', and after taking a look, I can see why... . . . . . some will embrace her style, but not all. I first found her when I was searching for illustrations on the internet that would be good examples and research for my wrong hand illustrations. One of the links was to video of her performing her poem "Heaven Knows" which I clicked on. I was completely and pleasantly surprised by her poetry as well as the performance itself. I became a fan instantly! Her illustrations that go with her poems are extraordinary. They have that sense of childhood playfulness and memory, yet the content plays on things which we all would not say out loud. Its a fun story book for adults and it always makes me smile. This is the intro page from the book scribbled in words with illustrations all around of random things. 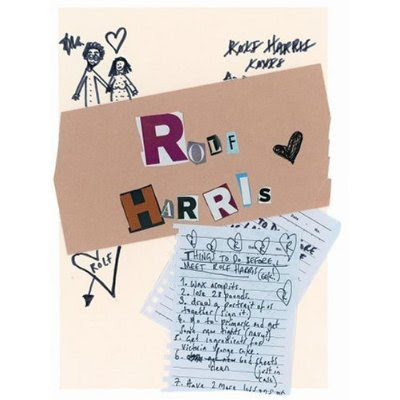 This is a page from the book that shows her notes from the poem "Rolf Harris" which are all things she wants to do before she meets Rolf Harris. The Video is taken from Youtube Laura Dockrill performing heaven Knows as MC Dockers. Please if you get chance you should check some of her other stuff out i think its amazing !! 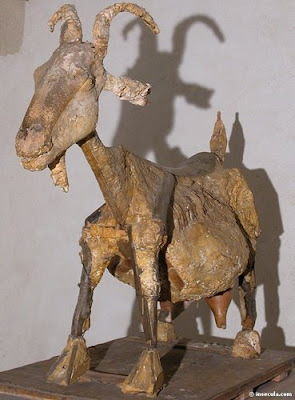 Some one once asked to Pablo Picasso "what is art" he turned picked up a bicycle seat and a pair of handle bars, a bulls head Appeared and he said "what isn't?" Labels: "Quotes", Artist, Inspiration, Thoughts. . . . 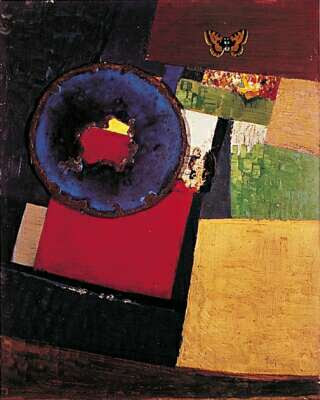 I was listening to BBC radio 4 iplayer the programe was John Wilson exploring the reasons why some artists use rubbish in their work. Rubbish, litter, waste has great value the modern world, it is what we create as a society but society has no value in it, yet artist designers can make things out of it. So in that sense it has great value, well it does for me! "Picasso, Dali, Georges Braque and Joan Miro all used discarded objects in their art, and in the last few decades there has been an explosion of artists using 'found objects' in their work to communicate many different messages about waste, consumerism and the dispensability of modern life." "Some artists are campaigners and artists in equal measure. John meets Fran Crowe, who creates installations and engages in performance art with the rubbish she finds on the beaches near her Suffolk home. He also talks to Sir Peter Blake, who celebrates litter and tries to create something of aesthetic value from it, and sculptor Gavin Turk, who looks for the beauty in objects that have been thrown away." I found this program inspiring, it is reminder of what I find so important, historically and culturally. For me waste, litter, rubbish is immediate yet valuable element which needs to be put back in to the world. Jewellery is not just for women . . . .
"Christine is a multi-faceted designer with one foot in jewellery, one in landscaping and (err…) one more in photography. Her unique line of jewellery features necklaces, bracelets and rings– all made from recycled rubber from bicycle tubes and air mattresses. From her Hanover, Germany studio, Christiane cuts tiny shapes out of these reclaimed materials and strings them together in to create these multi-dimensional and dynamic wonders." "Arranging an everyday used material to different creations - to wearable objects, becomes an interesting process of transformation. The final piece takes on another value"
His creations are known for their mixture of innovation and wear ability, for his ingenious solutions to how a garment's essential elements can be re-imagined. Considered by many as part of the new avant-garde designers, Martin Margiela is a master of deconstruction and reconstruction of garments. He can see beyond the garment and the fabric - like destroying a gown to create a jacket from it, ripping a lot of old socks and making a sweater from them. You can call it recycling, but it goes beyond that, because the final product is a far cry from the original fuelled by by his imagination. "Ski gloves are used as the raw material to create a blouson with or without sleeves. Over dyed in dark colours the gloves are unstitched and laid flat so that all original detailing may remain intact and they may be assembled directly on a black cotton base prepared on a tailor's dummy. Two inserted pockets are added to the front of each blouson." Mona Hatoum’s poetic and political oeuvre is realised in a diverse and often unconventional range of media, including installations, sculpture, video, photography and works on paper. Hatoum uses found materials, rich with patina and laden with personal resonance, to create poetic, beguiling works on an intimate scale. I collect all things which inspire me in one way or another, whether it be jewellery, fashion, design objects or information on arts, artists or designers. I have been looking through some of the things that I have collected recently, and from the past, which represent my inspirations and research to the way I am working now. 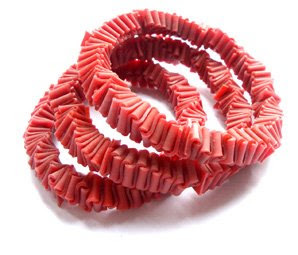 I am currently creating jewellery from recycled materials which i have spent the past few months researching the qualities of. "Maintaining a balance in an era of virtual communication, this age-old craft and industry continues to develop in innovative new ways . 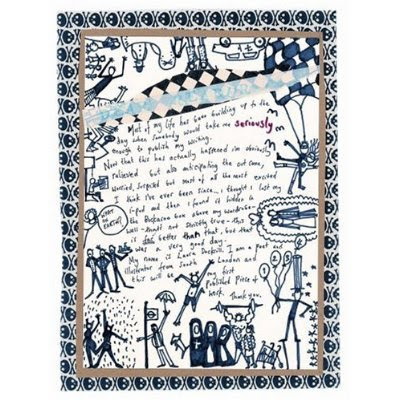 . . "
It explains how the idea of exploring a material for craft or any design; in this case paper; is even more important than before. In this day and age of the virtual world new technologies are being invented, improved and updated every minute. Working with contemporary crafts and exploring materials, especially unwanted ones such as paper, open up new doors for designers linking the traditional craft with new technologies, but even more importantly developing new innovative ways of thinking and working. The way that I work is to explore unwanted end of life material. Looking in to the initial qualities and creating new ones. 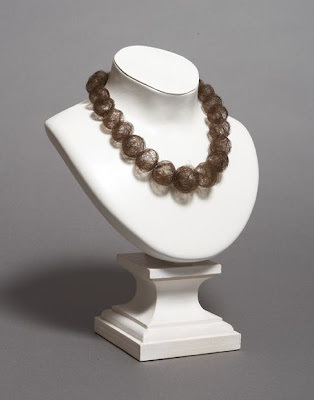 In the image above is a necklace made by the designer Janna Syvanoja, the necklace is made up of old paper from newspapers and books. 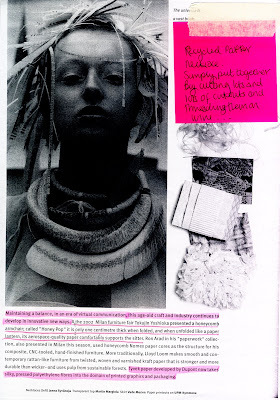 By exploring the material she has created a way of using unwanted materials. Recreating the material in to an contemporary design object means that she has created a niche for the unwanted material and her jewellery.